The focus of the all-new BMW 8 Series Coupe’s design was to provide an exceptional driving experience. Mission accomplished. The body, powertrain and suspension have all been tuned to achieve the car’s amazing agility, precision and poise. The all-new BMW 8 Series Coupe was developed in parallel to the BMW M8 GTE racecar. The new 8-Series luxury sports coupe will be built at BMW’s Dingolfing plant in Germany, where BMW 7 Series sedan production takes place. The all-new Coupe is the first key vehicle of the Munich-based brand’s luxury segment model plan. Sporting appeal takes on a new face with the 8-Series Coupe’s modern exterior design that’s blended with an air of sensual exclusivity and allure. The production model delivers on the form suggested by the BMW Concept 8 Series unveiled at Italy’s Concorso d’Eleganza Villa d’Este in 2017. 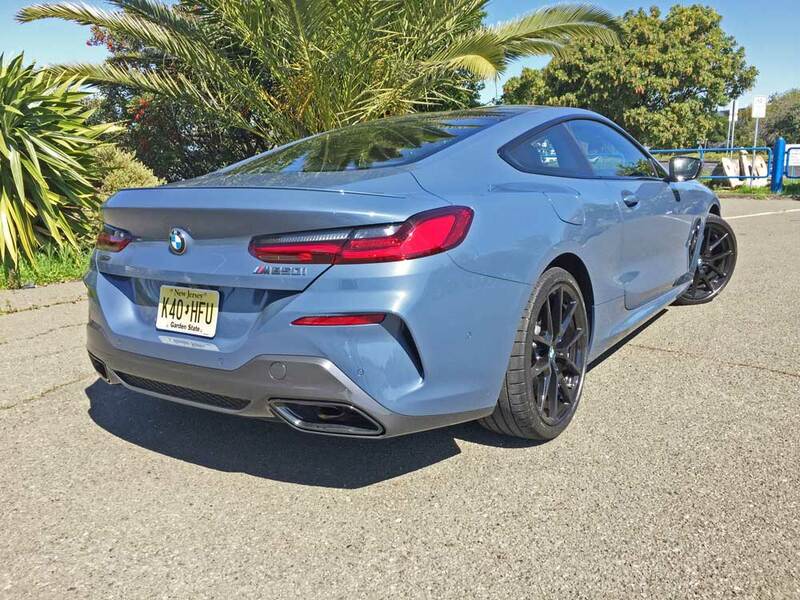 The 8-Series Coupe displays a low-slung, elongated silhouette featuring slim window pillars, a distinctive “double-bubble” contoured roofline akin to earlier classic sports coupes, a long wheelbase and an expressive wide track. A sculpted overall design form with new signature headlights aids in the dramatic visualization and promise of the car’s outstanding performance capability, enhanced by the exaggerated and elaborate jutting design of the front end with its large, functional air intakes, for an even more imposing persona when equipped with the optional M Sport Package. The kidney grill showcases increased proportions featuring a hexagonal outline that widens towards the bottom with a single-piece surround that encompasses it. The all-new 8 Series Coupe features standard Full LED headlights with BMW LaserLight technology similar to the slimmest headlights of any BMW model thus far. The cabin is sharply tapered at the rear, which accentuates the strong shoulder line. The elongated quarter windows end in a tightly angled version of the iconic Hofmeister kink “counter-swing”. The long, heavily raked rear window is a classic representation of high performance luxury sports coupes of yesterday. The aft end of the coupe is composed of sculpted surfaces emphasizing the car’s tail width and low center of gravity. Slim all-LED rear light clusters extend deeply into the flanks adding to the effect. 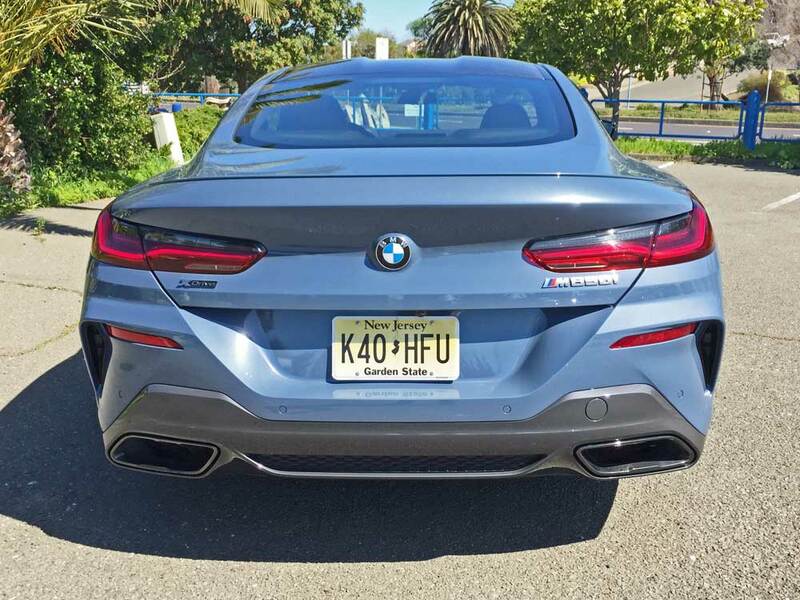 The taillights light uniformly in an ‘L’ shape, and twin exhaust tailpipes with a trapezoidal contour appear on either side of the rear lower section. An almost fully covered underbody, active air flap control with adjustable kidney grille slats and Air Curtains including Air Breathers aid in aerodynamacism along with narrow exterior mirror bases, mounted directly on the side window weather strips. The cabin was designed to aid the driver in focusing on and enjoying the task at hand. The wide center console rises up towards the instrument panel at the front, separating the driver and front passenger areas. This center space houses the audio control unit and its operational buttons, the air conditioning control panel and air vents along with the freestanding and frameless Control Display. Apart from the crystal gear selector and the iDrive Controller, the center console also accommodates the Driving Experience Control switch and the engine start/stop button, all arranged within a newly designed function cluster with active haptic feedback. The control unit for the light functions is new and consists of buttons placed at the bottom of the instrument panel between the steering wheel and the driver’s door. 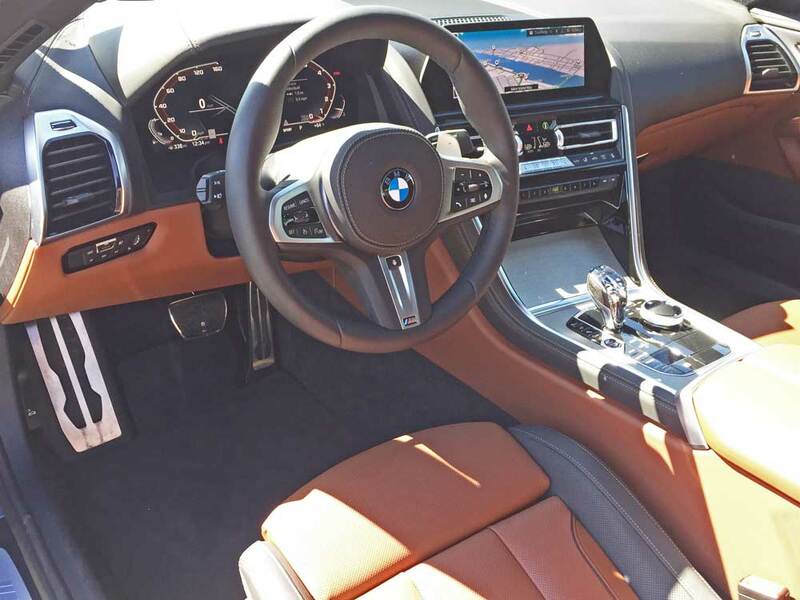 A leather M sports steering wheel with multifunction buttons and shift paddles for manual gear selection is standard. The newly developed sports seats are crafted individually in Merino leather with standard folding rear seats – all providing high levels of comfort and lateral support. Headrests are integrated into the backrests and may be adjusted for both height and fore/aft position. Decorative stitching in a contrasting color accentuates the sporting contours and a semi-electric folding function is included for front seat backrests, activated by a leather strap located on each seatback for convenient rear diminutive passenger entry and exit. There are also large door pockets, a roomy glove compartment, two cup-holders under the center console’s trim finisher and a large storage compartment under the armrest’s longitudinally divided covers for stowing travel accessories, beverages and other items. The rear backrest has a 50:50 split design. The backrest sections may be folded down either individually or together, further increasing cargo capacity. 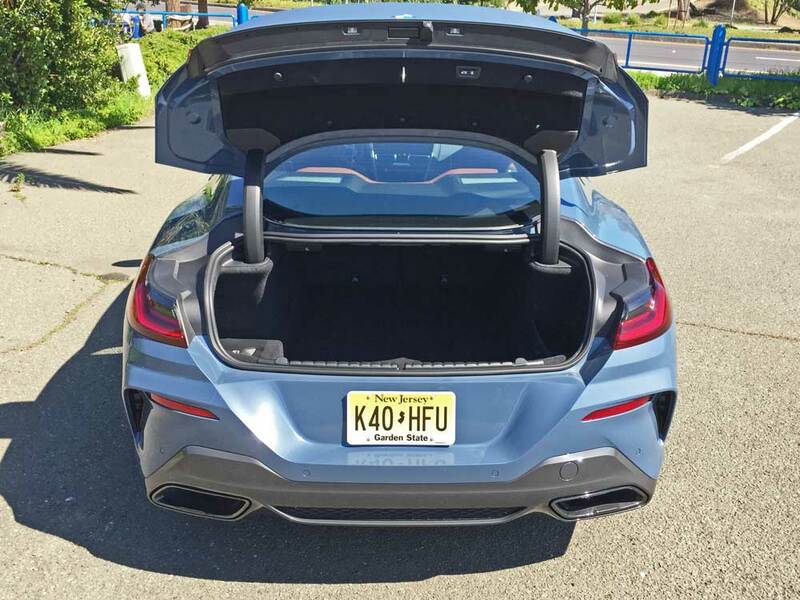 Automatic trunk lid operation is a standard feature, while the Comfort Access option permits hands-free opening and closing of the trunk lid. The new BMW M850i xDrive Coupe contains exclusive design features and options that enhance the driving experience. 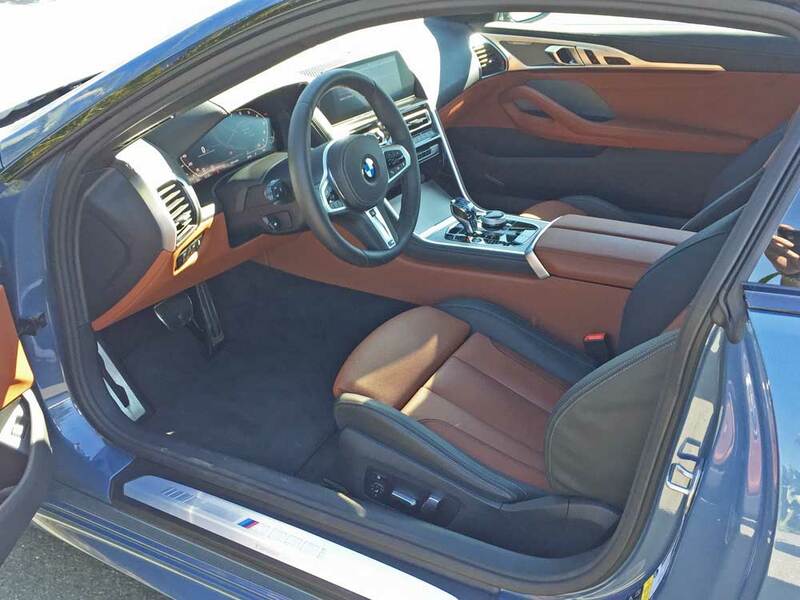 In addition to multifunction seats and the M leather steering wheel, there’s an anthracite BMW Individual headliner, M pedals, M driver’s footrest and special floor mats. The illuminated doorsills and the instrument cluster display feature the BMW M Performance Automobile model badge or the M logo respectively. 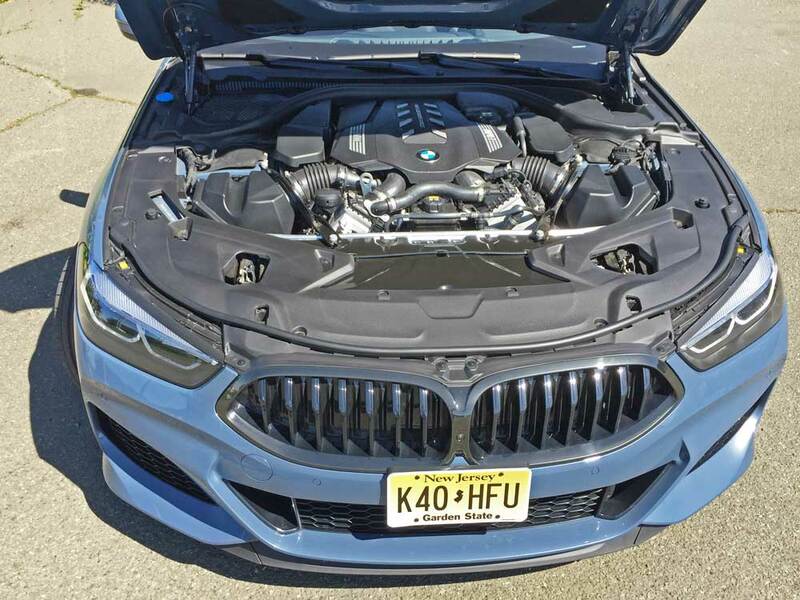 Under the hood, a longitudinally front -mounted 4.4-liter BMW M Performance TwinPower turbo, DOHC, 32 valve V-8 engine with Double VANOS and Valvetronic and high-precision direct injection supplies the “Get-up-and-Go”, producing 523 horsepower in a range from 5,500-6,000 rpm. along with a whopping 553 lb.-ft of torque from 1,800 to 4,600 rpm. An eight-speed Steptronic Sport Automatic transmission with Sport and Manual shift modes, steering wheel-mounted paddle shifters and Launch Control gear motive energy to the ground through BMW’s xDrive intelligent all-wheel drive system with rear wheel bias and differential lock. 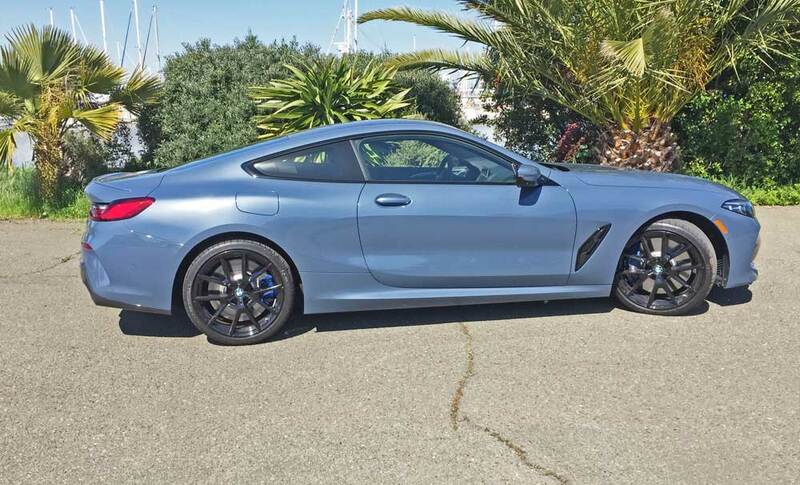 My test 2019 BMW M850i xDrive Coupe came with its exterior finished in Barcelona Blue metallic, the Carbon Fiber roof and the interior executed in Tartufo and Black tone of Merino leather with satin chrome trim accents. The base sticker read $111,900., while the final total amounted to $119,295 after factoring in options. 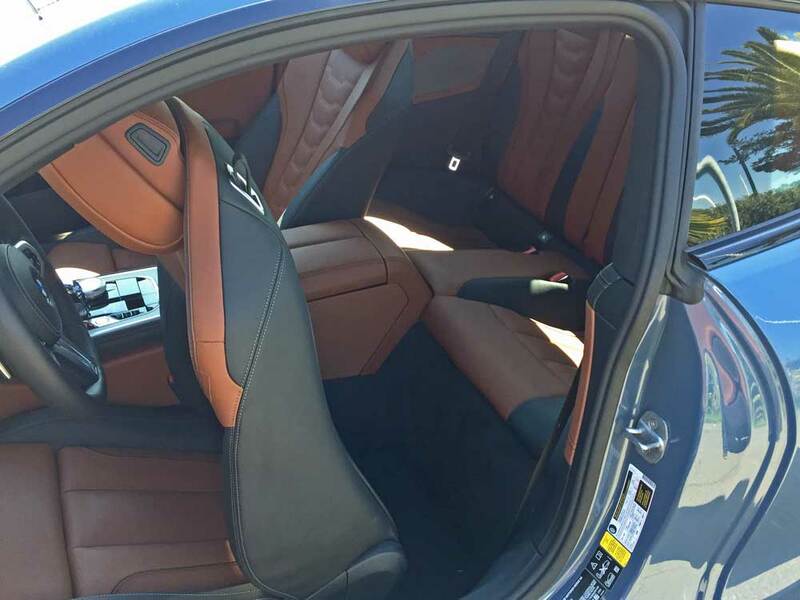 Phenomenal comes to mind in describing the performance capability of this sleek and highly desirable 8-Series Coupe. The big TwinPower turbo V-8 hurtles the more than two ton coupe’s mass from 0-60 mph in a mere 3.6 seconds with an electronically-limited top track speed of 155 mph. EPA mileage estimates are 18.0 mpg city and 25 mpg highway. 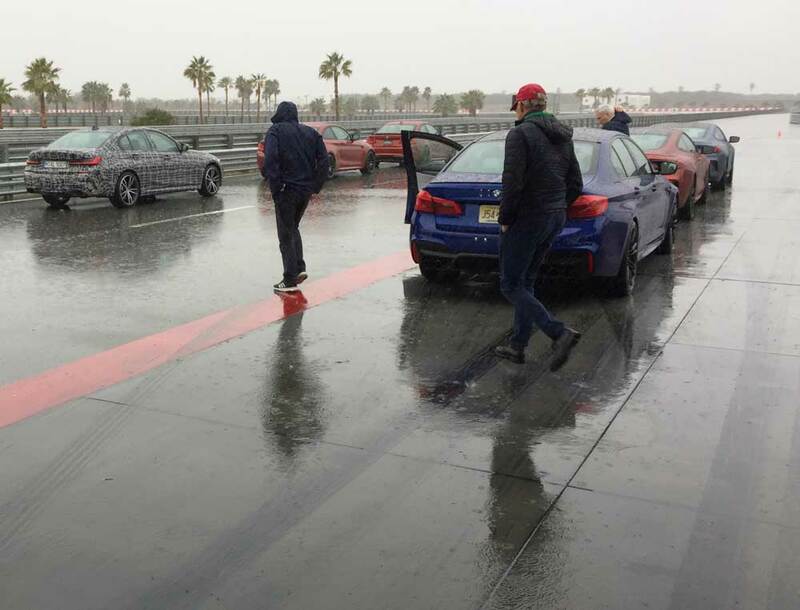 Prior to testing the new Coupe on my home turf for a week, I was able to experience its track prowess in the rain at speed through standing water at Palm Springs’ Thermal Club’s South Course track. While conditions were less than favorable, the M850i’s performance was stellar. The car was not phased in the least by the severely inclement weather conditions. Acceleration was blistering, steering was spot on and the overall handling characteristics were extremely positive and beyond reproach with amazing stability – all while in total luxurious comfort. It obviously also does quite well in normal every day driving with all of its power at the ready. 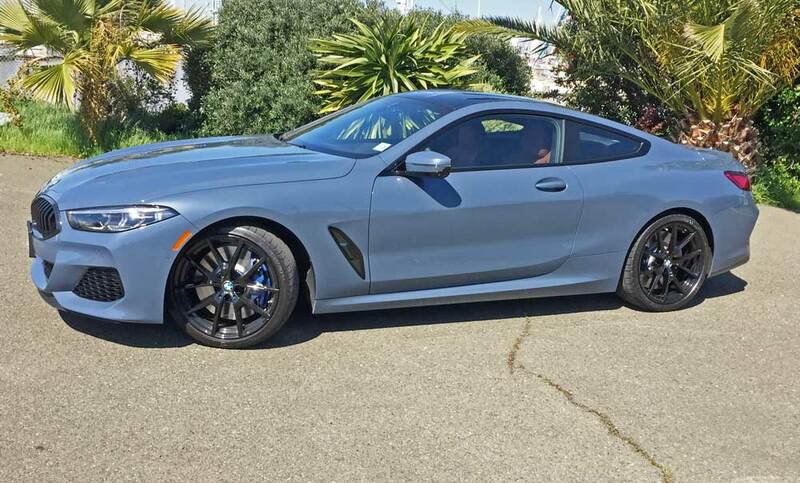 The 2019 BMW M850i xDrive Coupe is truly an amazing automobile. It’s worth every penny of its sticker price if you are fortunate enough to be able to afford it, and if you don’t need to carry two full sized adults in the back seat’s limited space. It is not only incredibly good looking, it’s incredibly comfortable and it’s incredibly quick as well, while prompting smiles. Its pleasing engine and exhaust notes are enhanced by the standard flap-controlled sports exhaust system. The Driving Experience Control switch may be used to activate both extremely sporty and distinctly comfort-oriented powertrain settings. In the SPORT and SPORT+ modes, accelerator response as well as the V8 engine’s power delivery and acoustics – which take on a particularly distinctive note in the SPORT+ setting – are all configured for an exhilarating motoring experience. The 8-Series is back with a welcoming vengeance. Engine Type and Size: 4.4-liter BMW M Performance TwinPower turbo DOHC, 32 valve V-8 with Double VANOS and Valvetronic and high-precision direct injection. Transmission: Eight-speed Steptronic Sport Automatic with Sport and Manual shift modes, steering wheel-mounted paddle shifters and Launch Control. Drive Train: Longitudinally mounted front engine / BMW xDrive intelligent all-wheel drive system with rear wheel bias and differential lock. Suspension: Adaptive M suspension with electronically controlled dampers. Brakes: Power-assisted M-Sport four-wheel discs with ABS,DSC, DTC, DBC and CBC. 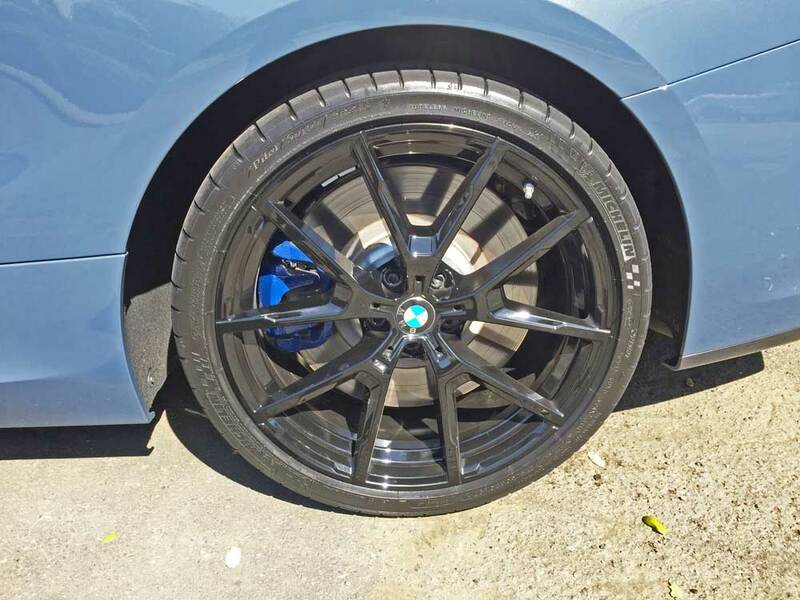 Tires: Michelin Pilot Super Sport High Performance 245/35 ZR 20×8” 95Y XL front / 275/30 R 20×9” 97Y XL rear mounted on 5-“Y”-spoke Black painted M alloy wheels. 0 – 60 mph: 3.6 seconds – Top track speed 155 mph electronically limited.